The WakaWaka Solar Lamp rechargeable light is very bright and has 5 different light modes, including an SOS beacon. This is a fantastic portable off grid solar light that is perfect for camping, hiking, emergency / disaster lighting, survival, SHTF & Doomsday Preppers. If you are looking for a very bright solar light, this is the one. It is not quite as compact as the d.light #S2 Solar Light, but it is still compact at 4.8" x 4" x 0.8" and weighs only 7 ounces. However, the WakaWaka Solar Lamp throws off a very bright light, and the internal battery should last about 3 years for daily use with no requirement for changing the battery. It is small enough to carry inside or outside with a carabiner clipped to your backpack Bug-Out Bag, and it will charge while you are hiking. When using it, you can hang it, stand it on a bottle, or stand it on a table. There are several versions of the WakaWaka. 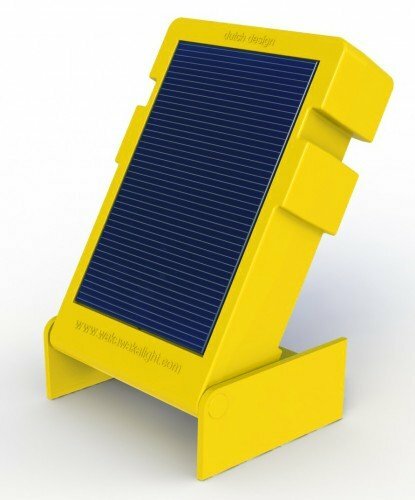 The original WakaWaka Solar Lamp pictured above (and sometimes called the "WakaWaka Lite") has the specs shown above (and up to 80 hours in night light mode). There is also the newer WakaWaka Power+ version (sometimes just called the "WakaWaka Power") that cost roughly twice as much, but will last up to 150 hours in night light mode, and also includes a Solar Powered USB charger. There are YouTube video reviews of both models below, and links to the WakaWaka Power+ version (in three different colors) are provided below the YouTube videos. "Best and most versatile light I've ever used. I like it so much that I bought another one for a gift. I leave it on the dash off my motor home so it's always fully charged when I need a flashlight and I never have to worry about needing batteries." "It is very bright as advertised and easy to operate. I like having a bright solar powered device ready for our too frequent power outages. ""....When the WakaWaka is turn to the lowest setting, it lasts all night and is still operating in the morning--usually a period of 9-10 hours. They're useful at camp where we have only gas lights. Highly recommended...."
"Takes a lickin......Talk about reliable. I accidentally left it out on a snowstorm. It fell off the fence where it had been charging during the storm, and was buried in a foot of snow. I added another couple of feet on top of it with the snow blower before I remembered. By then, all I could do was wait for the spring snow melt to uncover it. Prior to that, I had left it out in multiple rainstorms. And, of course, I've dropped it several times. After recovering it this spring, it works as well as the day I got it." "Everyone Needs a Waka Waka. Even after being one of the early supporters of the Waka Waka light on Kickstarter in May of 2013, I still love this light. It's well made, sturdy and works...it really works and performs. The solar panel charges the battery quickly, the light is as bright or dim as needed and it is designed to be used in several different ways. I like how it can be mounted on a glass bottle, like a wine bottle, to raise the Waka Waka up off the table and provide good light for whatever is needed to be done at the table. Everyone needs a Waka Waka light in their home for emergencies, in case you lose power at night." "Lightweight, versatile, bright lite....I was surprised at how small it is. But, actually, it's a lot better than a big one, it's very lightweight, easy to carry anywhere you go. I cannot believe how bright this little lamp is!! There were I thought reviews of led lights having a range on the color spectrum, near blue, potentially near ultraviolet. So I try not to stare into this or any led light for too long (and not look directly at the sun either). That would be for any led lamps, and as far as I can tell, all the lamps/ lights (including in cell phones, in power banks, keychain flashlights, etc. It should last practically forever. As I am hopefully getting more and more off the grid (not easy, but ya gotta start somewhere), this little lamp is really perfect! It's small enough to easily move / hang it in the sun light. The circular opening, for a bottle is great for hanging this lamp practically anywhere. I loop it over an old chandelier and it lights the room better than the chandelier ever did. It seems best up high-ish, like on a bookshelf, higher than ones head, pointing to what one is reading. 2 would be better for a good sized room. I've got a couple small lanterns which give dim light and are ok as a night light. This lamp has several settings from very Brite down to pretty dim. And a flickering beacon. I keep it on a windowsill all winter, and outdoors in warmer months. I will get a couple more of these to get the electrical bill lower, and lower. The solar panel is bigger than on many similar devices, eg, my power banks. I think another version of this has a cell charger port, so i will get that next...."
The following YouTube video is a review of the WakaWaka Solar Lamp (pictured above). The following YouTube video is a WakaWaka product demonstration of the more expensive WakaWaka Power+ Solar Lamp. The following YouTube video is an interview with CEO & founder, Camille Van Gestel about the more expensive Waka Waka Power+ at CES 2015. See our Top Ten Best Portable Solar Panels & Solar-Powered Products list.